Sisters, Debbie, Joni, and Kim (sister Kathy stepped away from the ensemble in 1989), are daughters of entrepreneur/actress Florez Sledge and celebrated Broadway performer Edwin Sledge. Their grandmother, Viola Beatrix Hairston Williams, an accomplished lyric-opera soprano, provided unique master class on vocal training to the siblings early on. Arranging for her granddaughters to perform at religious events and community functions, the quartet were first presented to the world as “Mrs. Williams Granddaughters.” Before long, they had made a band and with Debbie serving as vocal arranger, Joni as artistic director and Mom, Florez as manager, Sister Sledge was born. Performing jazz, soul, gospel, disco, and R&B, the multi-lead vocal group prospered equally in-studio and onstage. The sisters built a formidable status, astounding audiences and moving critics. They also made sure to complete academic studies, each of them earning a Temple University college degree. Achieving success across borders, the group enjoyed huge popularity in Africa, performing at the “Rumble in the Jungle” Ali-Foreman heavyweight-boxing match, in Japan where they won the prestigious Tokyo Music Festival Silver Prize, and across Europe. In the U.S.A they became a household name with the hit release of the iconic “We Are Family” album, fashioned by Nile Rodgers and Bernard Edwards. Following “He’s The Greatest Dancer,” came the albums pivotal title track, “We Are Family” which skyrocketed the group in to the musical stratosphere. “We Are Family” became the theme song for the World Champion Pittsburgh. The hit songs “Lost in music,” “Thinking of You” and “All American Girls” followed. After dominating at number one for over 4 weeks in the UK with the certified Gold single “Frankie,” Sister Sledge went on to team up with Incognito’s Bluey on the song “World Wise and Shine” which flew to number 1 in Italy and resulted in the now-trio starring in their very own TV show. In 1997 Joni Sledge produced the group’s 9th studio album, African Eyes, which was nominated for a Grammy as Best Produced CD, and remains one of their finest artistic achievements. In December 2000, Sister Sledge played at The White House for the President and First Lady at the closing Christmas party of the Clinton Administration. The sisters continued to tour and in 2005 performed on the famous pyramid stage at the Glastonbury Music Festival in the UK. In 2014 the group headlined at the Tramlines festival in Leeds, UK and worked with Scottish electronic producer The Revenge, on the track “Stay A While”, in London. In 2015, Sister Sledge were honoured to be invited to perform for Pope Francis at The world Festival of Families in Philadelphia, PA, along with Andrea Bocelli and Aretha Franklin. Debbie, Joni and Kim soon thereafter launched the brand concept and blog www.nothingisgreaterthanlove.org. Over the years, the group has amassed a string of Gold and Platinum records, accumulating total sales of over 15,000,000 worldwide. 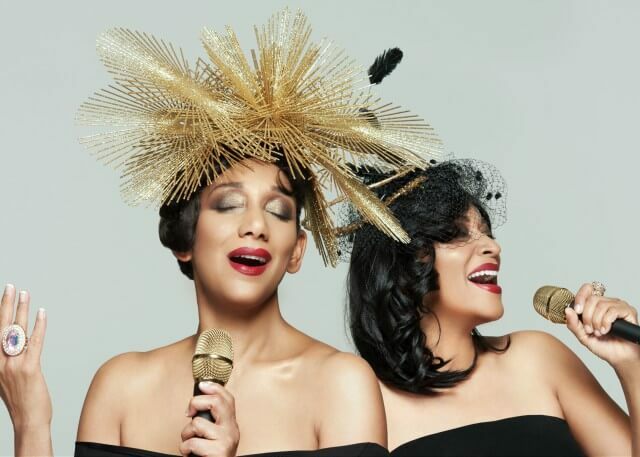 Garnering along the way additional Grammy Nominations for Record of the Year and Best R&B Duo or group, Sister Sledge has earned over 100 awards and commendations.